If large three-row CUV practicality with a fair measure of Mazda "Zoom-Zoom" character might be your cup of tea, take a look at the 2010 Mazda CX-9. Its combination of sporty looks, eager performance and people and cargo capacity should impress you. If your needs include a greater level of off-road prowess or heavier cargo and towing capability, one of many less sporty but more powerful and capable SUVs on the market would be a better choice. For 2010, the CX-9 receives a slight exterior and interior refresh, gaining the company's new signature front end, large side mirrors and a new headlamp/fog light design. The CX-9's interior upholds the exterior's sporting character but with more luxury touches than the less expensive CX-7. Its instrument panel has quad chrome-ringed gauges under a prominent hood and a logically laid-out audio and climate control area bounded by rich wood spears plunging from dash-top to floor and mirroring similar pieces in the door panels. The three-spoke steering wheel, contoured front bucket seats and two-tone trim say "sports car" more than "SUV," while blue indirect lighting adds an upscale glow at night. The 60/40 second-row seat reclines and slides forward to enhance third-row access, and both it and the 50/50 third seat fold flat into the floor, like many CUVs in this class, the CX-9's third row seat is best suited for children or diminutive adults. The 2010 Mazda CX-9 is well dressed for its role as the bigger brother of Mazda's CX-7 sport CUV. Its look is Mazda sporty, with a signature five-point grille over a wide, aggressive bumper, wrap-around headlights and a broad-shouldered tail with curving tail lights and twin trapezoidal chrome exhaust tips. One nice touch is a full-width chrome strip across the top of the black-out grille opening, which flows across the top of the large, centered Mazda logo and is mirrored again in the lower grille opening. Long rear doors allow easy access to the third-row seats, although it's still a bit of squeeze for adults venturing rearward. A lightly-loaded 2010 CX-9 does a creditable job of living up to Mazda's "Zoom-Zoom" marketing promise with its rigid unibody chassis, low-friction MacPherson strut front and independent multi-link rear suspension, precise engine-speed-sensitive power rack-and-pinion steering and stabilizer bars at both ends. Despite its substantial size and weight, it acquits itself surprisingly well on curvy country roads and rides smoothly and quietly at freeway speeds. With more people and cargo aboard, it is understandably less athletic and loses some performance, but it remains a satisfying ride. Unlike many three-row CUVs, there is ample adult-size room in all seating positions and 17.2 cubic feet of cargo space behind the third row. With just one engine and transmission combination, the 2010 Mazda CX-9 starts at a Manufacturer's Suggested Retail Price (MSRP) just over $30,000, while all-wheel-drive adds another $1,400 to the bottom line. A fully loaded Grand Touring can climb as high as $40,000. That places it higher than the five-passenger Ford Edge and about even with the three-row Chevrolet Traverse and Honda Pilot. Active Torque-Split all-wheel drive is an extra-cost option. The good news is that the CX-9, although slightly more expensive than many of its competitors, is projected to retain a higher resale value than the Edge and Traverse. Be sure to check Fair Purchase Prices to see what buyers are actually paying in your area. The 2010 Mazda CX-9 is offered in three trim levels: Sport, Touring and Grand Touring. The base Sport comes with three-row, seven-passenger seating, front and rear air conditioning, power windows, locks and mirrors, remote keyless entry, tilt wheel, cruise control, AM/FM/CD audio and six sets of air bags (front, side and full-length side curtain). Additional safety features include four-wheel ventilated anti-lock disc brakes (ABS), Traction Control System (TCS) and Dynamic Stability Control (DSC). The mid-range Touring and top-line Grand Touring add leather trim, power front seats and more. The 2010 Mazda CX-9 has an options list that mimics a premium-level sedan. Major options available on the CX-9 include SIRIUS Satellite Radio, DVD-based touch-screen navigation, Blind Spot Monitoring System, Surround Sound Bose premium audio with a six-CD changer (single disc when combined with navigation), rear DVD entertainment system, keyless entry and start, 4.3-inch view screen with rear backup camera and a power rear liftgate. All-wheel drive is an important functional option. This versatile center-row seat slides five inches to accommodate long-legged folks either on or behind it. The seat also has reclining backrests, offers easy access to the third row with a one-handed release and folds flat into the floor to optimize cargo room. On available all-wheel-drive models, sensors signal control modules to send more torque to the axle with the best traction automatically. Up to half the engine's torque can be sent to the rear through a computer-controlled coupling connected to the rear differential. The 2010 Mazda CX-9's 3.7-liter V6 is a variation of the 3.5-liter engine that powers its American cousins, the Ford Edge, however, the 3.7-liter version is specific to Mazda and Lincoln. It powers the front wheels through a six-speed automatic transmission, or all four wheels with Mazda's available Active Torque-Split all-wheel-drive. Car-based "crossover" utility vehicles (CUVs) try to marry the best attributes of passenger cars and SUVs, and these days they are leaving the woods and mountains behind. 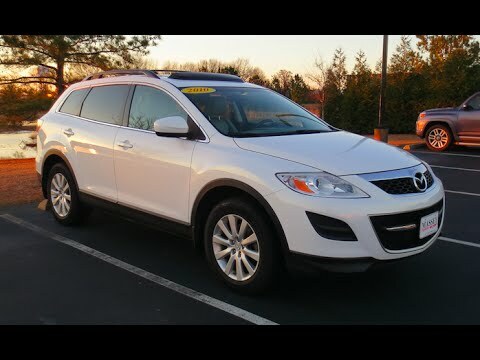 The goal is to offer a sporty, urban vibe, and none pulls this off better than the 2010 Mazda CX-9. It offers the tough-to-achieve blend of sport sedan and SUV that can corner and carry equally well. Like the smaller Mazda CX-7, the CX-9 is genuinely fun to drive yet still useful on a shopping trip or a family vacation. Of the two, the CX-7 may be a tad sportier, but its larger three-row, seven-passenger CX-9 stablemate, which shares its engine and much of its architecture with Ford's Edge and Lincoln's new MKT, delivers a similar feel while upping the utility quotient considerably. A perfectly sized, sleek SUV. The Mazda cx-9 is a comfortable, easy to drive, roomy vehicle that holds 7-8 people and still has room in the far back to put backpacks, etc.. The car seems spacious inside, but not too large like dome oversized SUVs. It is easy to park, and has a helpful rear camera. The sunroof is large and may be easily and quickly opened by pushing a button to slide or vent the sunroof. A helpful sunroom shutter can be used to keep out any unwanted light. There are a few negatives. There is not a navigation system, and the backlight camera sometimes gets water on it and it must be wiped off to see clearly. Also, the cup holders have a small opening, so things can inadvertently slide into the hole with no way to retrieve them. Finally, there is a small strip of plastic on the floor in the 2nd row which is difficult to clean. The flexibility of the amenities inside of the car are great. Built for lasting! I have enjoyed my car for years. It rides well in the city and on the highways.The troubles that I have encountered have been the mirrors falling off or turning in while going through car wash. It is spacious and can see a family of six or more. The trunk space is great and it travels well on the highway. We did have an occurrence when The axle broke and the car was resting on the wheel. That was a very scary situation. The car is great on gas and the music from Boise system is wonderful. Safe vehicle but some electrical issues. The screen will show an error saying contact dealership. The dealership wants you to get a new system however it eventually starts working again. I feel it is very safe. This is my 2nd. The 1st one was totaled because someone hit me from the side while I was at a stop and it rolled on it is side, but I was not injured. I barely felt the hit. None of the windows shattered. It was only totaled because all the side airbags deployed.